Nice and Tough !! Satisfied! The sleek and firm fitting case has continued to impress me. I recently had an otter box and my Carhartt case fits more snug and isn't as heavy. The rigid sides of the case allow for a better grip and feel. The quality of this product is like any other Carhartt product, Definitely recommend. This case is extremely grippy and is a better option to the otterbox in my opinion. Fits the phone really snug too. Glad to see carhartts quality, like all their other products, put into this case. Will this fit the iPhone XR? Does it cover charge port? Will this fit the xR? Will my iPhone 6s fit? If not do y’all have a case that will fit? BEST ANSWER: No, This case fits the iPhone X only. The XR is longer and wider than the iPhone X. I fond this out the hard way. Do yourself a favor and purchase an otter box for your XR you will be glad you did. Will this fit an iPhone XR? 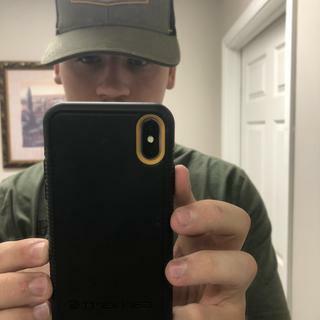 If not, will Carhartt be making an XR case? Will this case fit the iPhone XS? BEST ANSWER: Yes, They are the same size and I Highly Recommend this case! Will this case on the Iphone X Fit into the Cell Phone Holster you guys Offer? I can't find the dimensions and I need to know before I buy, Thanks.